Red velvet, in red cloth slipcase. Purchased by J. Pierpont Morgan (1837-1913) in 1906. Purchased by J. Pierpont Morgan (1837-1913) from J. Pearson in 1906; J.P. Morgan (1867-1943). 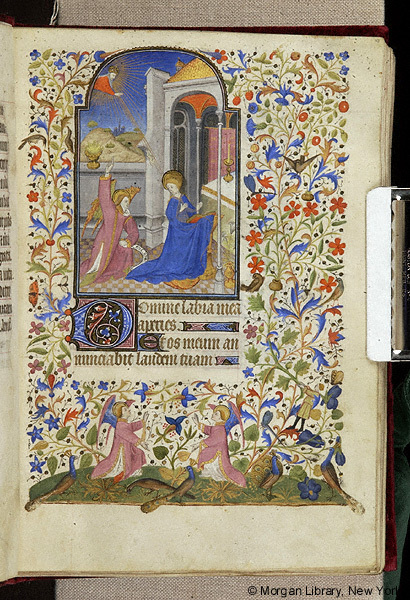 Ms. book of hours for the use of Paris (Hours of the Virgin, Office of the Dead); calendar in French, composite, mainly Paris; written and illuminated in France, Anjou or Brittany, ca. 1440. Decoration: 15 large miniatures, 44 small miniatures, 12 calendar illustrations.